The Royals bought Treanor from the Rangers and have since sold him back. All things considered, Treanor did exactly what the Royals wanted him to do, he was a veteran catcher and provided some experience to a really young team. His offense was alright, defense was great. I hope Brayan Pena was paying attention. Pena wasn’t paying attention. Pena solidified the perception that he can never be a starting catcher in the major leagues this year. He is below average offensively and defensively in my opinion. He is a stop-gap backup catcher and he shouldn’t be on the team next year. 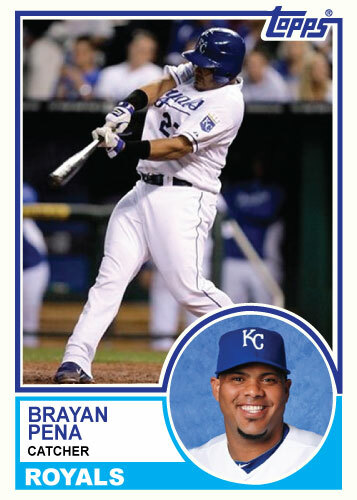 Royals fans will always remember his falure to get tags down that directly cost the team a couple games this year. Pina was a spark when Treanor went on the DL. He got a very short look while the team waited on Salvador Perez. Pina did nothing wrong but didn’t wow fans the way Perez has. He should be a solid backup for Perez. How can you complain about Salvador Perez? He has a cannon arm and has showed it. He is also hitting a not-so-modest .333 at this point. He has showed great power the other way and the ability to hit at the major league level. Expect a drop offensively next year but not defensively. Kila just didn’t cut in KC. He only had 23 games to strut his stuff and had a big walk-off home run but only hit .195. He was surpassed by Eric Hosmer’s performance in every aspect. #CountryBreakfast can flat out rake. He had a slow first half but really kicked it up after the break. He has pushed over 90 RBI now (career high) and had a power surge in the early second half. He was pushed to strictly the DH role by Hosmer and has now embraced it. Eric Hosmer has been nothing short of spectacular in his rookie season. He has hit for power, average and been a very good at first base (no matter what certain stats say.) He is a very strong rookie of the year candidate and in less than one season has become the face of the franchise. Chris Getz has a lot of haters. He doesn’t hit for a high average or extra base hits. He is good defensively and very good on the basepaths but these thing don’t redeem his insecurities at the plate. The team would likely be better off with Navarro as a utilityman than having Getz on the roster in 2012. Hasn’t been great defensively and has been average at the plate. He has had a typical half rookie season. Escobar is great in the field. He makes fantastic plays that most shortstops don’t. After a couple seasons of Yuni at short for the Royals, Escobar is a godsend. He is a .250 hitter and doesn’t really project to be a whole lot better. He doesn’t have much power but that should improve. With his defense he could hit .250 for the remainder of his career and remain a starter. Aviles was the Royals starting third baseman on opening day. This is hard to believe now. He was terrible in the field and at the plate. He then proceeded to whine about playing time after Moustakas’ callup. 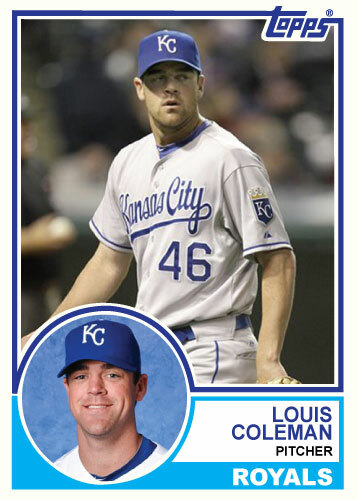 He has been good for the Red Sox but contributed almost nothing to the Royals in 2011. Betimit was trade bait from opening day on. His value never really got any higher than that day either. He had an average year and didn’t fetch much in a trade. In my opinion a fantastic trade. Aviles was dead weight and couldn’t play the field. Yamaico hasn’t played much for Kansas City. Navarro isn’t great but should be a solid utility infielder for the team in 2012. He was no Hosmer in 2011 but still ended up having a respectable rookie campaign. He got hot at the end of the season and raised his average about 50 points. He started driving the ball and stopped popping out to 3rd base. He showed many encouraging signs for 2012. After a few years of being a borderline major league player he lived up to his immense talent and had a just-off MVP type season. He was great in left field, had a ton of assists and has an outside shot at a gold glove. He showed good power and the ability to drive in runs which was my biggest concern in the past for him. For what Melky was expected to do how could you possibly complain? 201 hits? Nobody would have guessed that, not even Melky. He hit for good power, stole bases, scored runs and was the exact type of player this team needed. I hated this signing but he proved me wrong. Dyson is good and field and has amazing speed. He is a liability at the plate and until he can get on base consistently will contribute very little in the big leagues. He is super fast and is worth carrying as a pinch-runner but needs to hit. Francoeur was another signing I didn’t like. He didn’t walk and would swing at anything. He resurrected his career this head and had an amazing season. He never failed to impress in right field and has a cannon. He didn’t swing at junk as much as the past and maintained a good average. He was a great clubhouse guy and showed he will be a great leader for this young team. Maier never got a lot of playing time because of A) no injuries and B) great outfielders ahead of him. When he got a spot start he did admirably but never really got a chance to impress this year. Cain tore up AAA Omaha and never got to the Royals until the last week of the season. He is ready to go but has no place to play. He would be very good trade bait for a starting pitcher if packaged with another high-end prospect. 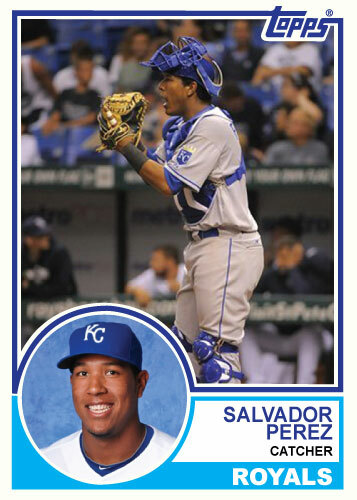 Salvador Perez has been fun to watch so far this year. He has hit better than expected since his call-up and his defense has been good(as expected.) I’m guessing he will inherit the starting catching job next year as he has it right now. He is still young and that might be a concern working with pitchers and controlling the game. I say put him in the lineup until he proves he can’t be the starting catcher at this point. Manny Pina appears to be a good second option for a young catcher. The Royals have had Jason Kendall and Matt Treanor on the team to provide experience in managing the younger pitchers. Treanor was traded and Kendall won’t catch any next year so it could be Perez and Pina. Brayan Pena is a good backup but really hasn’t shown the ability to be a starting catcher in the big leagues, he is a good second catcher thought. It remains to be seen what the team will do with Pena in 2012. 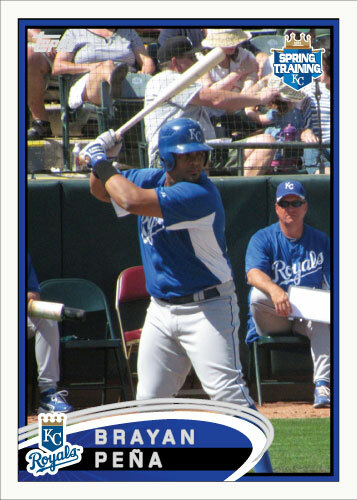 This continues my 1983 Topps Royals set for every player on the 2011 team. I was caught up soon after the Moustakas callup but now am a few cards behind. I plan to get them posted before the end of the season. Hopefully some more new faces will be appearing as well.